West Virginia isn't what I would classify as a southern state, we did secede after all. However, we very much so have a southern culture which shines through in our food. 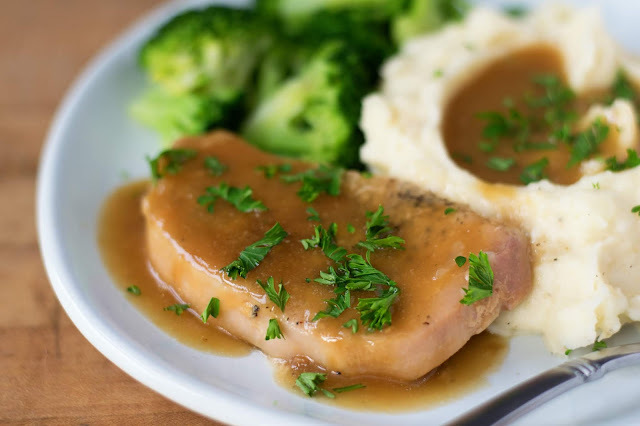 For example, we like to smother just about anything with gravy. Why? BECAUSE IT'S DELICIOUS and this Crockpot Smothered Pork Chop Recipe is the perfect example of that! To begin you will season the pork chops with the salt, pepper, and garlic powder on each side. After that combine the chicken broth, cream of chicken soup, onion soup mix, and pork gravy in a mixing bowl and whisk together. Pour the liquid over the pork chops in the crockpot. Place the lid on your crockpot, set on LOW for 4 hours. When there is 30 minutes to an hour of cooking time left on the slow cooker combine the cornstarch and water in a small dish and mix together. Place the lid back onto the slow cooker and let cook for 30 minutes to 1 hour. This allows the gravy this thick and get nice and silky. And there you have it! 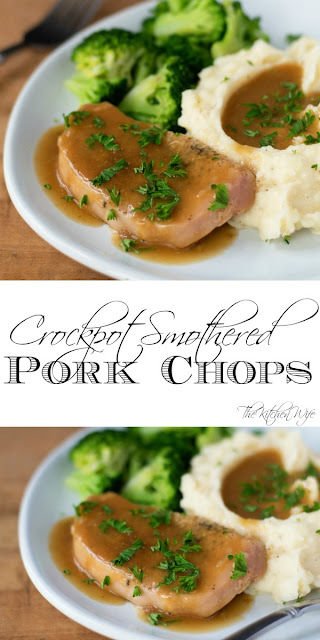 This is quite possibly the best pork chop you will put in your mouth! 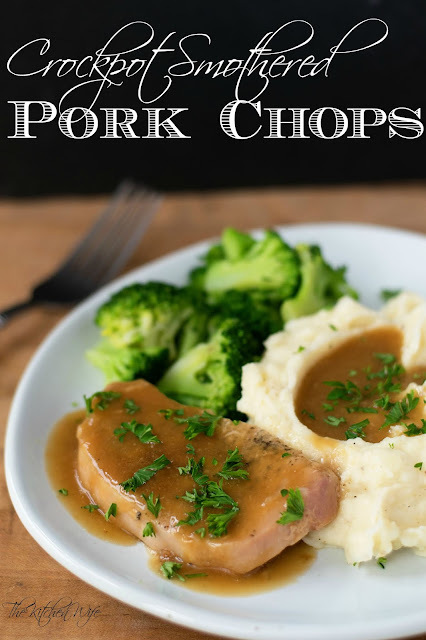 There is no lacking for flavor and these Crockpot Smothered Pork Chops are so tender you don't even need a knife! I like serving them up with a side of mashed potatoes and a green veg. Dinner is served! I know you're gonna love this one so get in the kitchen and make it TONIGHT! Season the pork chops on both sides with the salt, pepper, and garlic powder. Place the seasoned pork chops into the bottom of the crockpot. In a mixing bowl combine the chicken broth, cream of chicken soup, onion soup mix, and pork gravy mix. Whisk together. Pour the gravy mixture over the pork chops. Place the lid on the slow cooker and set to LOW for 4 HOURS. When there is 30 minutes to 1 hour of cooking time left combine the cornstarch and water in a small dish and mix together. Pour the cornstarch slurry into the crockpot and stir. Cover the crockpot and let cook for another 30 minutes to 1 Hour.